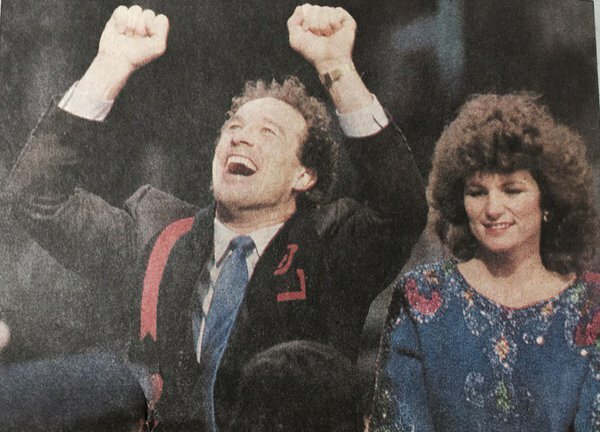 Gary Carter- Mets Career: On December 10th, 1984 the Mets landed the man they needed to put them over the top, one of the last pieces to their Championship puzzle. 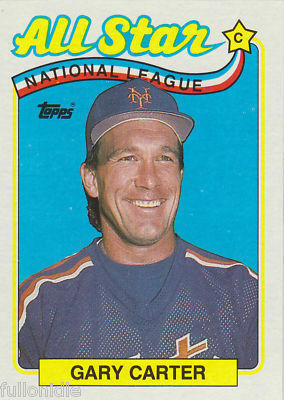 They got Gary Carter from the Montreal Expos in exchange for Hubie Brooks, Mike Fitzgerald, Herm Winningham, and Floyd Youmans. The Kid arrived with a lot of hype & fanfare going into the 1985 season. He was the leagues second highest paid player for the next two seasons. 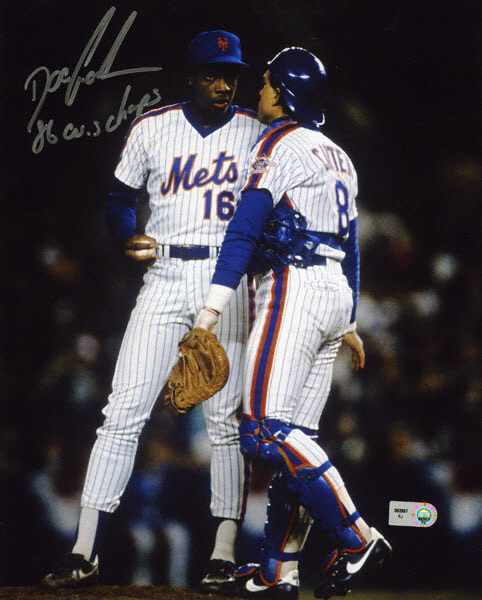 Carter delivered immediately, on Opening Day 1985, he hit a 10th inning walk-off HR against the rival St. Louis Cardinals & former Mets pitcher Neil Allen. 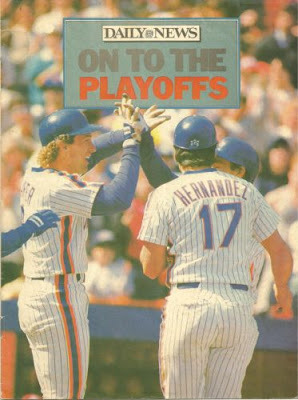 The HR gave the Mets a 6-5 Opening Day Shea Stadium victory & a bright start to the New season. In the first week of the season, he had three HRs with four RBIs becoming an immediate fan favorite & instant New York celebrity. With his big smile & curly hair off the field, and his aggressive intense play on the field, Carter got a lot of advertisement offers. He could be seen smiling all over billboards & TV commercials in New York City. He always signed autographs, sometimes holding up the team bus because he couldn't say no to the fans. He loved the game & all that surrounded it. But on a team filled with party guys & an appetite for the wild side, Carter was an outcast. He knew the others made fun of him, but he never gave it back, he just played hard. He didn't drink, smoke, or do any drugs. Carter was a solid family man, who didn't stay up late, go out to the bars or fool around with other women. 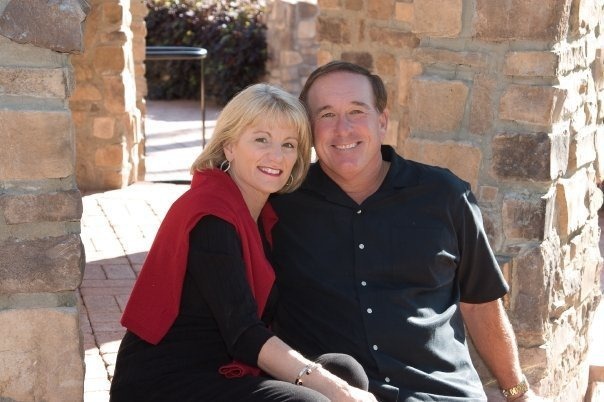 His relationship with his wife & family meant everything to him, even more than the game. He loved his wife so much, he once said he wished he could take her on all the team flights. 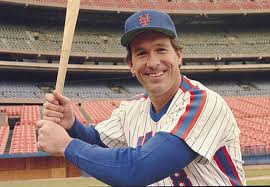 Carter was also a religious guy & took alot of criticism from his wild mid 1980's Mets team mates. Morally at that crazy time period, the Kid was the last of the good guys from another era. In the month of May he was very productive, driving in 18 runs as the Mets new cleanup hitter, sitting in the middle of a very powerful line up. On May 17th, his base hit in the 9th inning off the SF Giants- Scott Garrelts. It was another walk off game winner for the Kid. On May 29th in a game against the Giants at San Francisco, Carter came to bat in the top of the 8th with two on & the Mets down 3-0. He singled, bringing in two runs & then scored on George Foster's base hit as New York went on to a 4-3 victory. 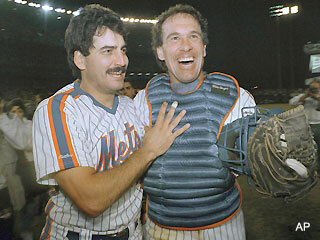 The next day he drove in a 6th inning run, which turned out to be another game winner, helping Doc Gooden to a 2-1 win. On a mid June road trip to Philadelphia, the Kid drove in runs in three straight games, that included a four hit day on June 12th. It came during a personal six game hit streak, in a stretch where he hit safely in nine of ten games. On July 4th, Carter was behind the plate for every inning of the Mets insane 19 inning marathon game at Atlanta's Fulton County Stadium, against the Braves. He was the team's leading hitter in that game, with five hits, a walk, two RBIs & a run scored. He caught seven different Mets pitchers that day, as Tom Gorman ended up with the victory six hours & ten minutes after the game began. In July he made the All Star team representing the Mets for the first time. He did not play due to an injury which had him miss a week of play. He would make four All Star teams in his five seasons playing in New York as a Met. When he returned he closed out July with back to back games where he drove in three runs. Both games came against the Houston Astros at Shea Stadium. In the first on July 25th he hit a three run blast off future Mets nemesis, Mike Scott. On August 8th the Kid blasted a three run shot in Montreal in front of the fans that still loved him & against the team that would eventually retire his uniform number. On August 11th he hit a pair of HRs against the Chicago Cubs at Shea Stadium, driving in four of the Mets six runs in their 6-2 win. At the end of August into early September Carter had a tremendous road trip on the West Coast, in nine games he hit nine HRs with 15 RBIs. He hit safely in every game, gathering up 18 hits, to raise his average 15 points during that stretch. His incredible hitting earned him both the Player of the Week & Player of the month Awards. On September 3rd in San Diego he hit three HRs while driving in six runs carrying the Mets to a 8-3 victory. During the month he was the most productive Mets batter with 40 hits, bashing 13 HRs driving in 33 runs. Carter had eleven multiple hit games & eight multiple RBI games as well. Overall on the season he had a career high, team leading 32 HRs (5th in the NL). He drove in 100 runs (6th most in the NL) with 18 game winning RBIs & 17 doubles. He also led the team in slugging (.488) hit by pitches (6) intentional walks (16) total bases (271) & double plays (18). He caught 143 games behind the plate (2nd in the league) posting a .992 fielding % (also 2nd in the league) throwing out 51 base runners trying to steal (35%) & leading the league in put outs (956). Carter came in 6th in the MVP voting & was one of thee Mets (along with Gooden & Hernandez) to finish in the leagues top ten in the MVP voting. 1986 Championship Season: Carter went hitless on Opening Day 1986, then sat out the second game but had a big day in the third game of the season. In that game, he hit his first HR of the year, a two run shot, had five hits overall while driving in five runs in the Mets 9-7 win. From there he had a ten game hit streak. On April 21st, he had a walk off, game winning single in a 6-5 win over the Pittsburgh Pirates. In his first month he drove in 19 runs, and was batting .312. On May 14th & 15th, he hit HRs in back to back games against the Astros in Houston. A preview of that years NLCS. Following that series, the Mets went on a West Coast run, overall Carter drove in six runs over the nine games he played in. 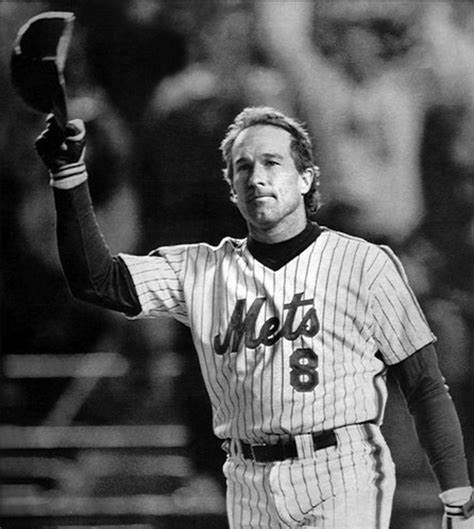 When the Mets returned home, he drove in two runs in an 8-1 win over the L.A. Dodgers, then had another RBI the next day in a 4-2 Mets win. He drove in over twenty runs in each of the summer months of June & July. On June 10th, in Philadelphia, he hit two HRs, driving in four runs leading the team to an 8-4 win. He then hit HRs in back to back games he played in, which included a three run shot at Shea Stadium on a June 20th, 10-3 Mets blow out. He closed out June with back to back games where he had two hits with two RBIs, both Mets wins. 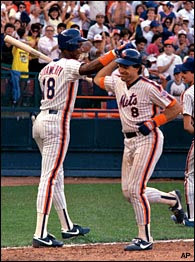 On July 10th, the Mets hosted the Atlanta Braves in a three game set, Carter hit a solo HR in the opening 5-1 Mets win. On July 11th, he had a huge day, almost single handedly clobbering the Braves. In the bottom of the 1st inning, he hit a three run HR, off David Palmer to put the Mets on the board first 3-0. In the bottom of the 2nd, Sid Fernandez & Wally Backman singled. Keith Hernandez walked & in stepped the Kid. Carter blasted a grand slam, putting the Mets ahead 7-0, with all the runs driven in by Carter. El Sid & the Mets went on to a 10-0 shutout. 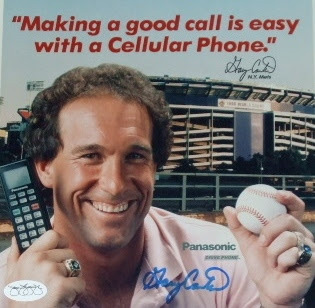 From July 17th- 21st, he drove in five more runs, with RBIs in three of four more games in the Astrodome against Houston. On July 27th, Carter hit a three run HR off the Braves Rick Mahler in Atlanta. It was the first of three consecutive Met HRs, as Darryl Strawberry & Kevin Mitchell joined in the slugging. In August, Carter had five multi RBI games. In a suspended game on August 6th, he drove in three runs in a 7-6 Mets win at Wrigley Field in Chicago. The next day, he drove in three more runs the next day in a 1-3 Mets win. He was sidelined with injury for the final two weeks of August '86. In September he began the month with five straight games where he drove in at least one run. On September , the Mets entered the 8th inning down 3-2. After Keith Hernandez tied the game with a single & was then picked off, Carter provided the game winning HR off Lance McCullers. The Mets ran away with the NL East that season, clinching on September 17th at Shea. Carter went 1-4 in that game, as battery mate to Dwight Gooden. Carter had one more multi RBI game in the regular season, with 4 RBIs including a three run HR on October 2nd.closed out the regular season with a thirteen game hit streak winning his second straight Silver Slugger Award & coming in third in the MVP voting. 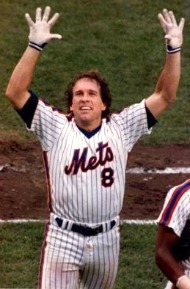 For the 1986 World Champions, Carter led the team in RBIs with 105 which were third most in the league. He also led the team with 15 sacrifice flies, which were also tops in the league. He was second on the club to Daryl Strawberry with 24 HRs (9th in the NL). He also hit 14 doubles, had 81 runs scored & batted .255. He was hit by six pitches (6th most in the NL). Behind the plate, he handled a young and talented pitching staff well enough to make them the best in baseball. He caught 122 games behind the plate (5th most in the league) was second in the league in put outs (869) & third in fielding (.992%) throwing out 28% of base runners attempting to steal. He allowd 114 stolen bases which were third most in the league. 1986 NLCS: At first, Carter struggled in the NLCS vs. the Houston Astros. By Game #5 he was only batting .050 in the Series, and in a horrible slump. Wally Backman was on second base, facing Houston’s reliever Charlie Kerfeld. 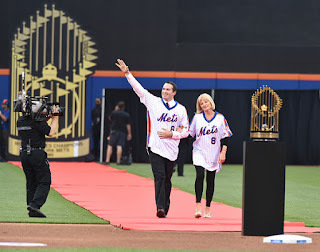 As the tension mounted with each pitch, Carter finally delivered, he singled up the middle, scoring Backman for a dramatic Mets victory, giving them a 3-2 Series lead. 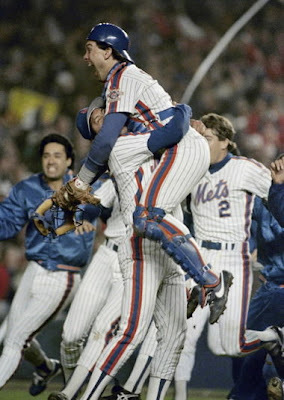 Shea Stadium went wild, and Carter raised his hands screaming back in joy after his biggest hit yet as a New York Met. In the epic sixteen inning Game #6 at Houston, Carter, ever the workhorse behind the plate, caught every inning. After going 0-3 he greeted reliever Dave Smith, in the 9th with a base on balls. He was stranded on third as the Mets tied it at three. He walked in his next at bat & then singled in the 14th inning, but was forced out at third. He added another single in the 15th. 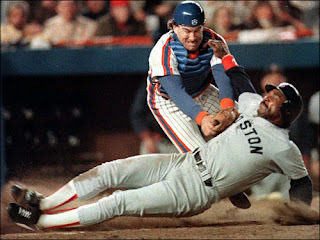 1986 World Series: In the World Series Carter got a hit in the each of the first two Series game losses to the Boston Red Sox. In Game #3 at Fenway Park, the Mets began their comeback when Len Dykstra led off the game with a HR. Wally Backman & Keith Hernandez both singled. Then, the clean up man, Carter doubled home Backman with the Mets next run. 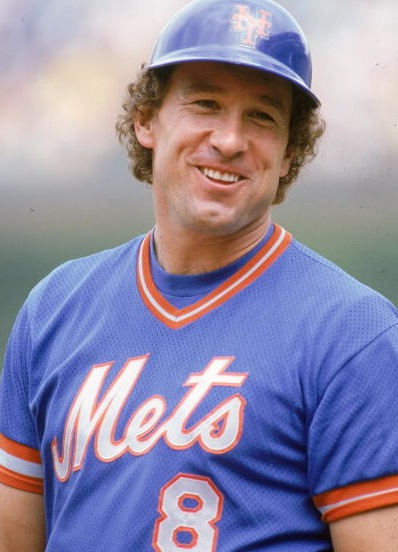 He then scored on designated hitter Danny Heep's base hit, as the Mets went up 4-0. Trivia: Danny Heep was the first ever official Mets DH in that at bat. 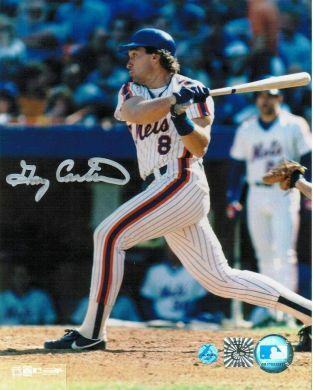 In the 7th inning, with the Mets ahead 4-1, Carter singled off Oil Can Boyd, driving in Rafael Santana & Lenny Dykstra for two more Mets runs, as the Mets went on to a 7-1 win. Carter was 2-5 with 3 RBIs & a run scored. In Game #4 at Fenway Park, Carter was the hero once again, as he hit a pair of HRs & drove in another three runs with three hits. 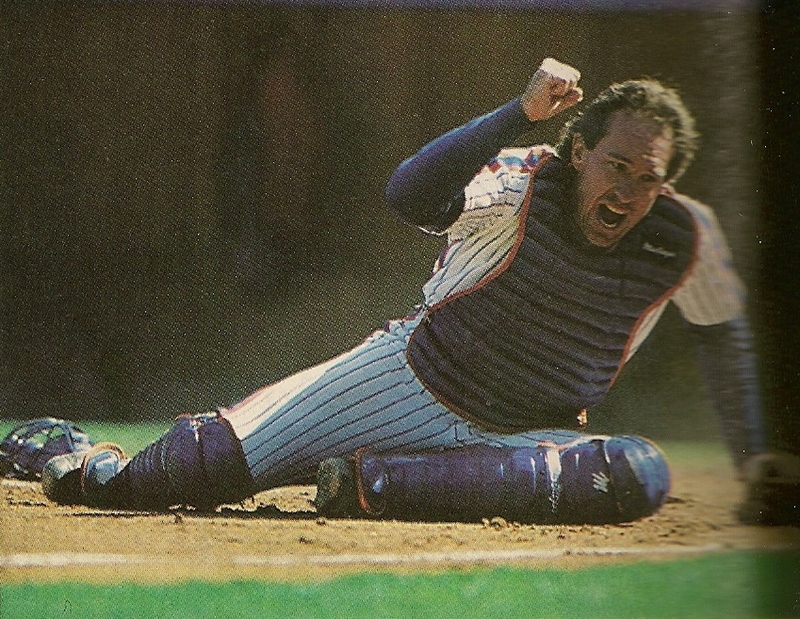 Carter helped the Mets tie the Series at two games each. In the 4th inning his two run shot came off Sox hurler, Al Nipper, it put the Mets on the board first. 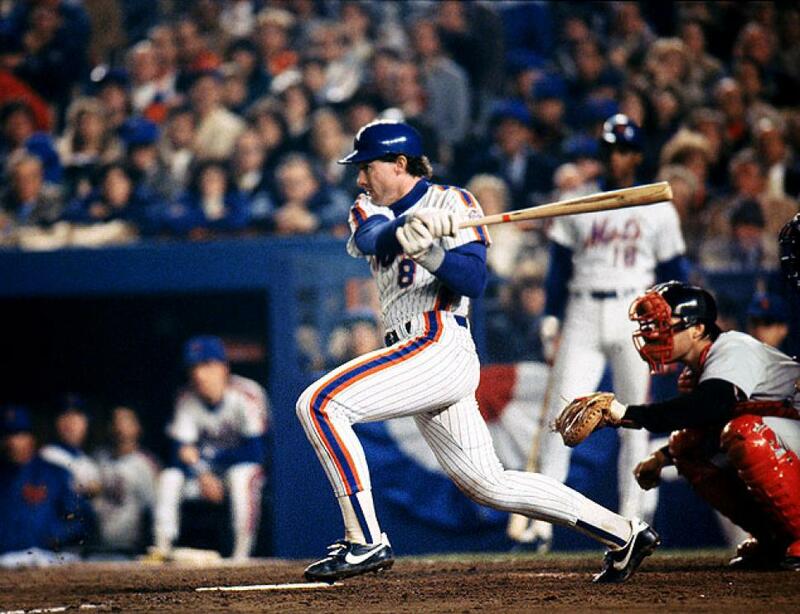 He added an 8th inning, solo shot off Steve Crawford, helping New York to a 6-2 win. He was hitless in Game #5. Game Six: In the classic Game #6, Carter made a great defensive play in a key spot in the 7th inning. 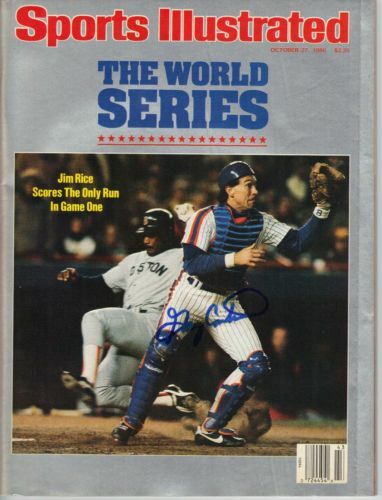 With two outs, Red Sox catcher, Rich Gedman singled & Jim Rice attempted to score from second base. Left fielder, Mookie Wilson, who was to be a hero later in the game, threw a bullet to the plate. Carter stood his ground & tagged out Jim Rice for the third out. That prevented the Red Sox from scoring another run which would have put them up by two. The photo of Carter tagging out Rice have become famous, most notable on the cover of Sports Illustrated (Oct 1986) & the box set of the Ken Burns, PBS Baseball documentary. The Mets were down 3-2 in the 8th inning, when Carter's sac fly scored Lee Mazzilli, tying the game at 3-3, sending it to extra innings. In that classic 10th inning, Carter started the Mets two out rally, getting the first base hit of the inning. Carter himself wrote: "I was our last hope, and as I took my place and looked out at Schiraldi, all sounds shrank back, and I felt a presence in me, or perhaps besides me, a calming certainty that I wasn't alone. I was not alone, and I was not, so help me, going to make the last out of the World Series. I felt certain of that." 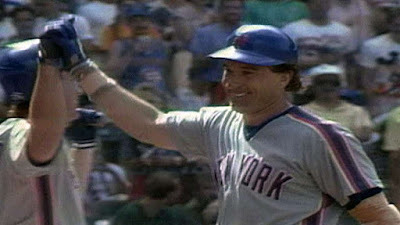 He would come around to score on a single by Ray Knight, the first of the three Mets runs that inning. In Game #7 he went 0-4 but was behind the plate when Jesse Orosco got the final strike out in the 9th inning as the Mets were World Champions. Overall he led the team while tying Dwight Evans for the Series lead, with nine RBIs. He went 9 for 29 (.276) with two HRs two doubles and four runs scored. In 1987 Carter returned to have his last productive season, as his age. wear & tear began to catch up to him. His average fell to .235 & he wasn’t leading the team in any power numbers. He hit 20 HRs (4th on the club) with 18 doubles while driving in 83 runs (5th on the club). He was behind the plate for 135 games, posting a .991 fielding % (still 4th in the league) with 874 put outs (2nd in the league) throwing out 27% of base runners. On Opening Day he began the year with two hits, in the Mets 3-2 win over the Pirates. In the month he drove in runs in three straight games twice, finishing the month with a dozen RBIs. He slumped in May but then got hot in June with a nine game hit streak, hitting safely in 19 0f 22 games into July. On July 1st, he hit a pair of HRs driving in three runs leading the Mets to a 9-6 victory. On July 16th, he hit a three run HR, driving in four runs having a solid month with 15 RBIs. In August he hit two HRs against the Phillies on August 5th & then hit a grand slam in San Francisco on the 30th. In the final game of the regular season Carter hit a two run HR against the Cardinals to finish off his year, as New York missed the playoffs finishing second. 1988 NL Eastern Champion Season: The 1988 season started out well for Carter, in the third game of the year, Carter blasted a pair of HRs in the 8-5 win over the Expos in Montreal. He hit another the next day. 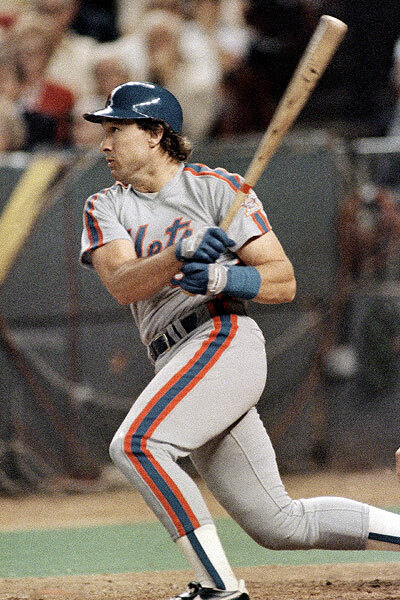 In a big series against the Cards, Carter hit HRs in back to back games, as the Mets swept the series. On April 18th, he hit a HR driving in four runs in a loss to the Phillies. In April, he had 15 RBIs & batted .333. On May 16th, he had another four RBI day, in a 7-4 Mets win at San Diego. In that game he hit career HR #299, one shy of a mile stone. But then he fell into a slump, as he went more than 230 at-bats before hitting another HR. The 300th career HR finally came on August 11th,1988 at Wrigley Field in Chicago. The pitcher was Al Nipper, former '86 Red Sox. The Mets won the game 9-6. That month he hit two HRs driving in eight runs. He ended August, showing signs of slowing down, with some of the poorest numbers of his career that late in a season, he was batting just .243 with 10 HRs & 43 RBIs in 111 games. During the final month of the season, Carter only hit one HR & had RBIs in just two games. 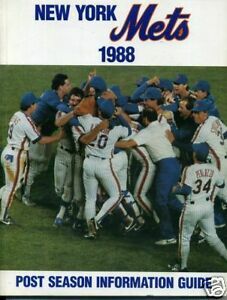 On September 22nd 1988, the Mets clinched the NL Eastern title, their second in three years. Carter had two hits in that game. Overall in 1988, Carter played in 130 games (119 at catcher) he hit .242 with 11 HRs 16 doubles 46 RBIs & a .301 on base %. Defensively he posted a .990 fielding %, making none errors (2nd in the NL) but allowed 136 stolen bases, most in the league, with nine passed balls. 1988 Post Season: In Game #1 of the 1988 NLCS against the Los Angeles Dodgers, Carter once again proved to be a post season hero. In the top of the 9th, inning the Mets were down 2-0. 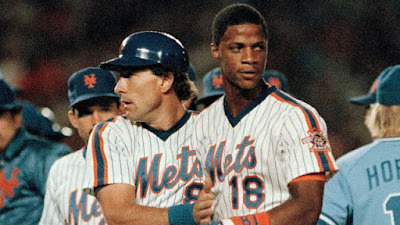 Darryl Strawberry drove in Gregg Jeffries with the first run. With Straw aboard, Kevin McReynolds drew a walk. Carter then hit a two run double off Dodger reliever, Jay Howell putting New York ahead 3-2. Randy Meyers shut LA down in the bottom of the 9th & the Mets won Game #1. Carter had two hits in the game. In the Mets Game #3 win at Shea Stadium, Carter got a 6th inning, RBI base hit off Orel Hershiser, bringing the Mets within a run. In Game #4, the slow running Carter, surprised everyone getting credit with a triple (of all things) driving in Kevin McReynolds. The Mets had a 4-2 lead, but when Mike Scioscia hit a two run HR in the 9th inning to tie it, the Mets fortunes changed. They lost the game & then eventually the series in seven. Overall in the Series Carter, hit .222 (6-27) with four RBIs. By 1989 Carter was 35 years old 15 years of catching behind the plate caught up to his beaten up body. He was limited to just 50 games due to injuries, as Barry Lyons & Mackey Sasser took over the catching duties. Carter batted .183, with 2 HRs 8 doubles & 15 RBIs. 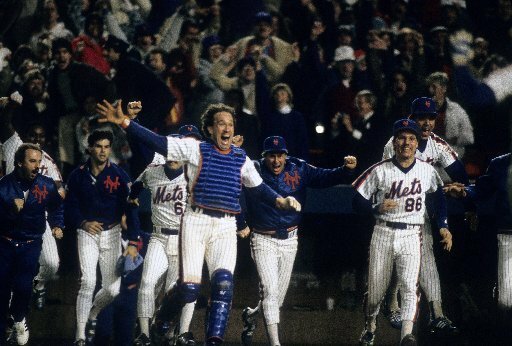 As pieces of the 1986 Championship season kept going away, the Mets released Carter that winter. 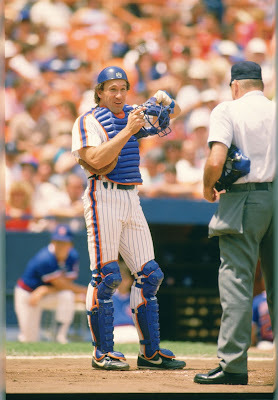 Mets Career: In his five year Mets career, Carter played in 600 games- 566 behind the plate (5th most) while hitting 89 HRs (19th all time) with 73 doubles 219 walks 349 RBIs (20th all time) and a .249 average. In 1990 he played for the San Francisco Giants as back up to Terry Kennedy putting up 9 HRs 27 RBIs & batting .254 in 91 games, 80 behind the plate. 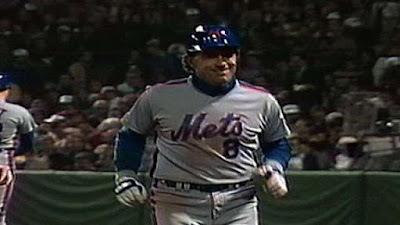 He returned to Shea Stadium as a visiting player on May 8th, to big ovation getting a 7th inning single off Sid Fernandez. He also drew a walk in the 4-1 Mets win. In 1991 he returned to his hometown area of Los Angeles signing a one year deal with the Dodgers. He caught 68 games behind Mike Scioscia & played in ten games at first base as well. Carter hit 6 HRs with 26 RBIs while batting .246. That next winter he was picked up on waivers by the team whom his career began with. He finished out his career in Montreal in 1992 playing in 95 games with 5 HRs 29 RBIs, batting just .218. 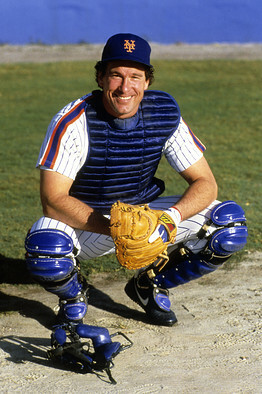 On September 20th Carter was behind the plate catching his last game at Shea Stadium in the Mets 1-0 win over Montreal. 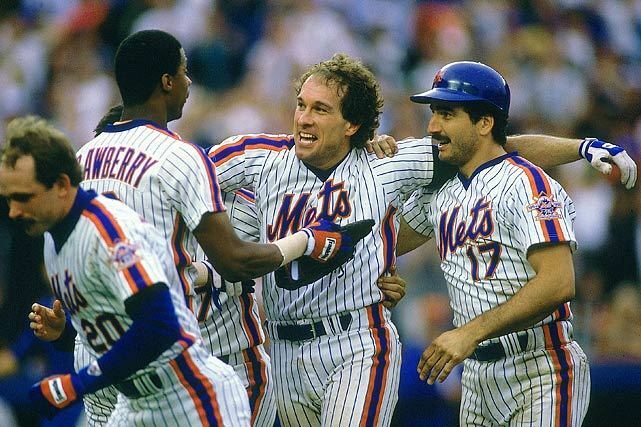 Dwight Gooden, Sid Fernandez, Howard Johnson & Dave Magadan where all who remained from the 1986 Championship team. Carter went 0-3 that day & only played in two more games before retiring. That season his Expos finished in second place just behind the Pittsburgh Pirates. 106 intentional walks (118th all time) 726 extra base hits (169 all time) 99 sac flies (31st all time) 180 double plays grounded into (169th all time) in 2296 games played (115th all time). He ranks sixth all-time in career HRs by a catcher with 298. Behind the plate he is fourth all time with 2056 games played, 11785 put outs (6th all time) 1203 assists (24th all time) with a 991 fielding % having thrown out 810 base runners (23rd all time) 35%. He has turned 149 double plays at catcher (10th all time) made 121 errors in 13109 chances & allowed 1498 stolen bases (5th most all time). Retirement: Carter was an analyst for the Florida Marlins television broadcasts from 1993-1996. He managed the Gulf Coast Mets in 2005 & the St. Lucie Mets in 2006. He also managed the Orange County Flyers of the Golden Baseball League as well as the Independent League Long Island Ducks. The following season he managed the NCAA Division II Palm Beach Atlantic University team in his near his home in Florida. Carter resided in Palm Beach Gardens Florida with his wife Sandy, together they had three children. He has also authored the book Dream Season recapping his year with the Mets. 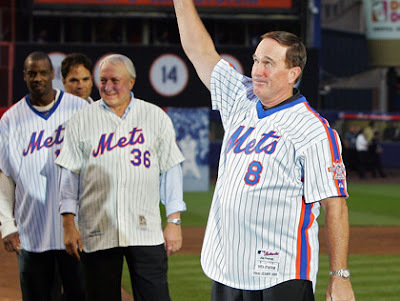 In both 2004 & in 2008 Carter openly spoke out about managing the New York Mets. 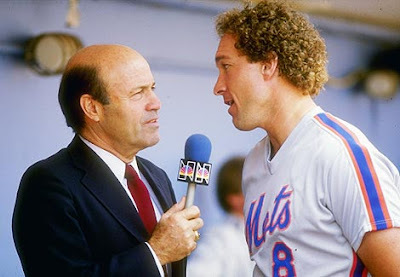 He has been criticized by some, including Keith Hernandez for doing so while managers Art Howe & Willie Randolph were still holding the positions. Honors: In 2001 Carter was inducted into the New York Mets Hall of Fame. 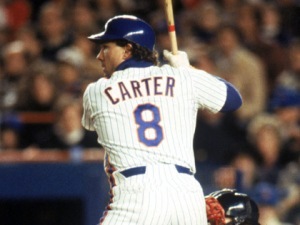 While the Mets have not retired number 8 it has remained unused since Carter's election to the Hall of Fame. That same year he was inducted into The Canadian Baseball Hall of Fame & had his uniform number 8 retired by the Montreal Expos. In 2003 he was selected to the Baseball Hall of Fame at Cooperstown, getting inducted with former short time Met Eddie Murray. 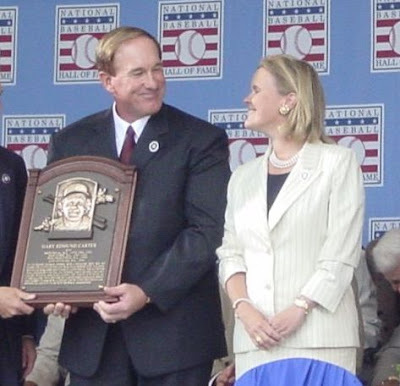 Carter is & will always be, the only member of the Baseball Hall of Fame to wear an Expos cap on his plaque. In 2010 he was diagnosed with brain an aggressive form of brain cancer. On February 3rd, opening night of Palm Beach Atlantic University's baseball season, Carter came out to greet the club he had managed. He rode in a golf cart greeting the players and smiling the whole time as he asked the team for a win, never mentioning his condition. He watched three innings of the game from a private box with former Palm Beach County residents & ex major leaguers Jeff Reardon & Tommy Hutton. 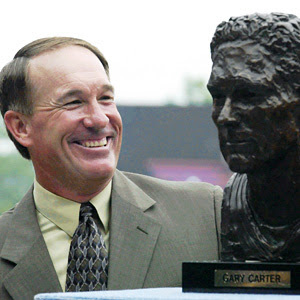 Less than two weeks later on February 16th, 2012 Carter passed away at age 57. Daryl Strawberry had very touching comments on Carter as he called into a local radio show. He said he respected Carter as a man even more than the great player he was. Dwight Gooden who won the 1985 Cy Young Award, with Carter as his main catcher, credits him with a lot of his own success. Gooden described Carter as true gentleman & a true leader. He said even with Carters' battle with cancer, he encouraged Gooden on his own personal abuse issues, saying they must both battle their problems. 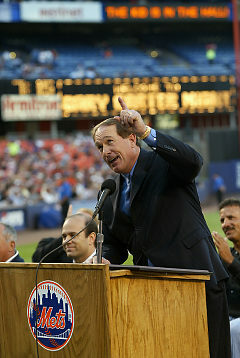 On Opening Day 2012 the Mets honored Gary Carter & his family in a pregame ceremony at Citi Field. A banner reading Kid 8 was unveiled in the outfield & the team wore a commemorative patch on their sleeve all season. Honored in Canada: In 2014 the Mets & Blue Jays played two exhibition games at Olympic Stadium in Montreal where Carters legend was honored. 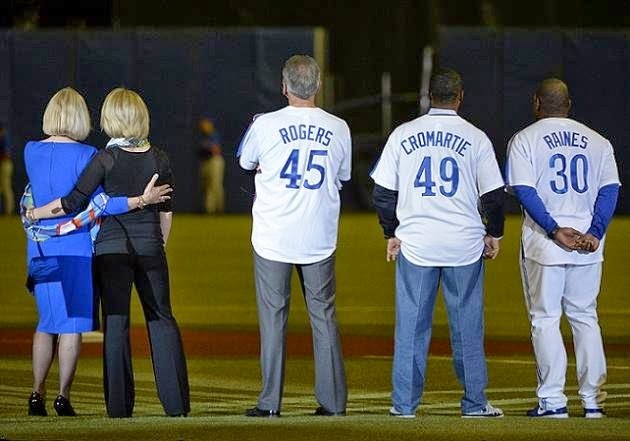 In a pre game ceremony, Expo legends; Steve Rogers, Warren Cromarte & Tim Raines were on hand with Carters wife & daughter as a banner was unveiled on the outfield wall. In 2016 for the 30th Anniversary of the Mets 1986 World Championship Team his family was honored at Citi Field.